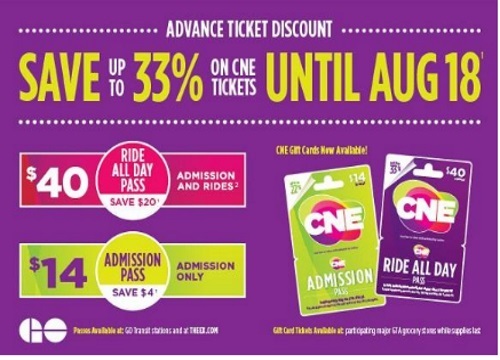 The CNE (Canadian National Exhibition) is coming soon! Purchase your tickets in advance before August 18 and save up to 33% off! $40 Ride All Day Pass (Admission and Rides, save $20). The Advance Ticket Discount is available online (link below), in gift card malls at participating major grocery stores, and at GO Transit stations and Union Station. Offer ends August 18.